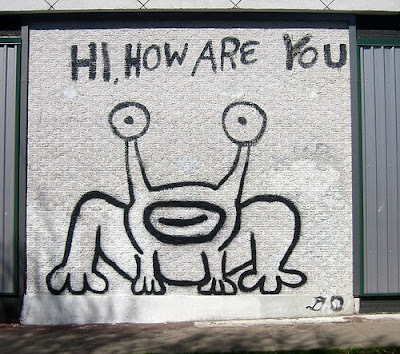 Daniel Johnston's back in town! I have finally fixed my computer - Phewee! That took long enough! It feels good that I can finally get back to blogging a little more often, what's not so good is that I have to catch a train in a moment to do some important research (will tell you more at a later date) and am eating my lunch at the same time as typing i.e. I won't be catching up with my writing today. Later this evening I'll be busying along to the Union chapel to see Daniel Johnston perform. I've wanted to hear what he sounds like live for a while so I'm looking forward to this -especially as it's in a great venue where I can have a cup of tea and sit down. Have a great week!